Bulk filtration housings provide complete filtration systems for particulate and water removal with quick installation at remote sites. The DVX Series can be used in parallel to function in higher fuel requirements. It is available in three sizes for a variety of applications and flow requirements. The versatility makes the DVX Series applicable in many different market segments for superior fuel cleanliness. The standard DVF series offers several options in element micron ratings, including water absorption and a range of single vessel flows. They are designed to meet today’s engine manufacturers’ requirements for clean fuel while allowing older engines to operate at maximum efficiencies. The DV series can coalesce water from diesel fuel in flows from 330 gallons per minute to 2,100 gallons per minute in a standard single vessel. The DV series from Parker can easily achieve OEM requirements for water in parts per million. 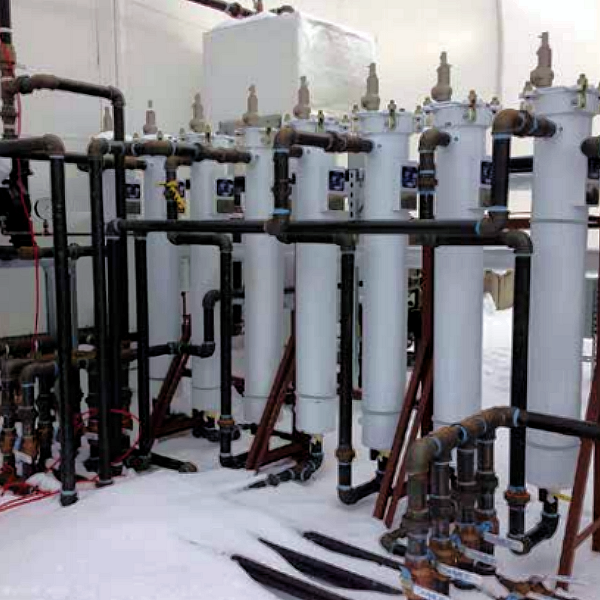 The DFS offers a complete fuel filtration solution which incorporates both particulate and water contaminant removal technologies mounted on a skid base that can be quickly installed and put into operation.